One of the buffed bodies in Polyascko2 signature print pants. Photo by Andi Liliquoi Gaspar. 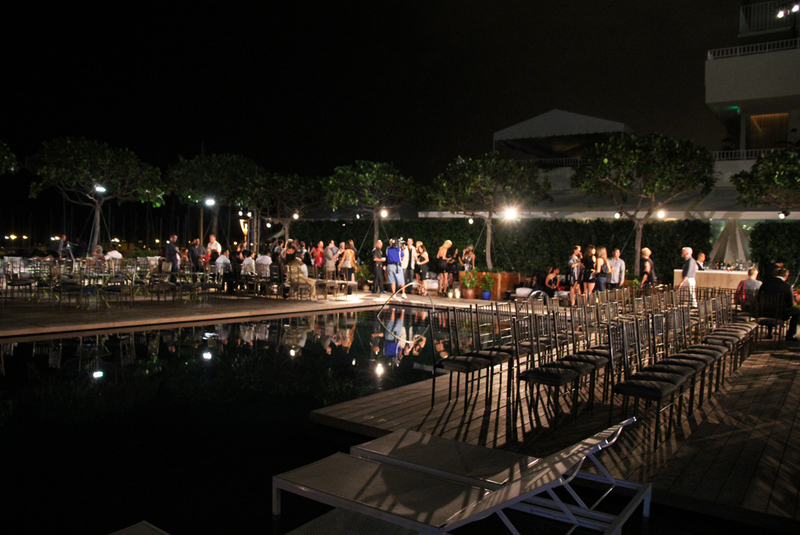 The setting at the Waikiki Edition. 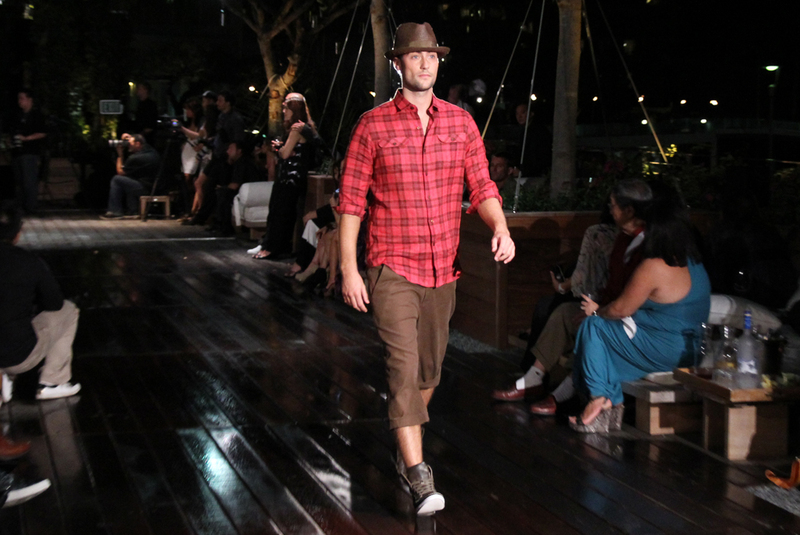 Photo courtesy of Tracy Chan of Nonstop Honolulu.The Polyascko2 fashion show last night set the tone for the new line, which is now designed in Hawaii and made in Italy, as I reported in this blog last Wednesday. I have been following these talented brothers since 2003 so it was especially gratifying to see them rise again.They chose The Waikiki Editon’s pool deck as their venue, which was lovely but felt a bit crowded with all the rows af chairs. There was a nice Hawaiian blessing of rain, but not enough to send everyone running for cover. I couldn’t help thinking how cool it would have been if the models had “walked on water” over a plexiglass bridge over the pool. The runway was a long one, though, as it traversed the circumference of the deck, offering lots of time to see the clothes.Time. Hmmmm. Should a fashion show really go on for more than 40 minutes? I think the crowd felt it went a bit long. Some editing would have been welcomed.Polyascko2 is not afraid of color! Color is de rigeur at Polyascko2. Whoa! Something weird happened with the formatting of ths blog and I can’t seem to fix it. Sorry! My lede turned into a caption. Yuck! But the “boys” are back, big time. Their signature 3/4 length shirts, in gorgeous Italian fabrics from mills in Como and Lugano, were paired with their signature print pants, as well as layered with hoodies, boyfriend sweaters, gentlemanly vests, blazers, even shorts and jeans. The looks ranged from casual resort to geek chic to out on the town. One of my favorite pieces was a safari-themed jacket with a great collar, chic self belt and lots of stitched details. Dr. Alvin Chung told me had already bought one; not surprising as he has such great taste and his body is perfect for the Polyascko style. The models were terrific and got lots of wolf whistles from men and women alike. These clothes require a certain body type: not too tall (or the proportions would go off-kilter) and not too thin (or the pieces would hang on the body like a hanger instead of creating flattering, buffed shapes). An athletic guy with broad shoulders and muscled thighs would be ideal. Orthopaedic surgeon Jim Scoggin, who was at the show, would be just right in many of these clothes. He’s the quintessential urban gentleman, who is clearly the target for Polyascko2. The Urban Gentleman as interpreeted by Polyascko2. Photo by Andi Gaspar. Vests long and short were layered with shirts casual and dressy. I loved some of the styling. It was so fun when they put together a black 3/4 sleeve shirt with white cuffs and collar, red bow tie, red belt, black pants and red patent shoes.I loved the layered knit shirts in bright colors. The brothers are not afraid to use coral, red and even hot pink in their collection and it looks great on the guys. They also had some beautiful neutral grays sparked with red or yellow. Although it made some local guys kinda squirm, many of the pants, especially the narrow leg ones, ended at the ankles. This will take some getting used to. We are certainly seeing it on the runways in Paris right now, but how long will it take for Island men to feel comfortable with this length? Another pant length seen on the runway. Suffice to say, the Polyascko brothers have been working extremely hard to bring this collection to the runway. They looked completely exhausted at the end of the night, but I hope they’re happy. It was quite an accomplishment. Great to have you back, Gerald and John Alexander! This entry was posted in Hawaii Fashion, Uncategorized and tagged Gerald and John Alexander Polyascko, Polyascko2, Waikiki Edition. Bookmark the permalink. Hey it’s Jesse, one of the Models from the Polyascko2 Fashion Show. Got any pics of me from that night? Send me some, I’d greatly appreciate it. Thanks!!! Sorry, no. My camera got so wet it stopped functioning. 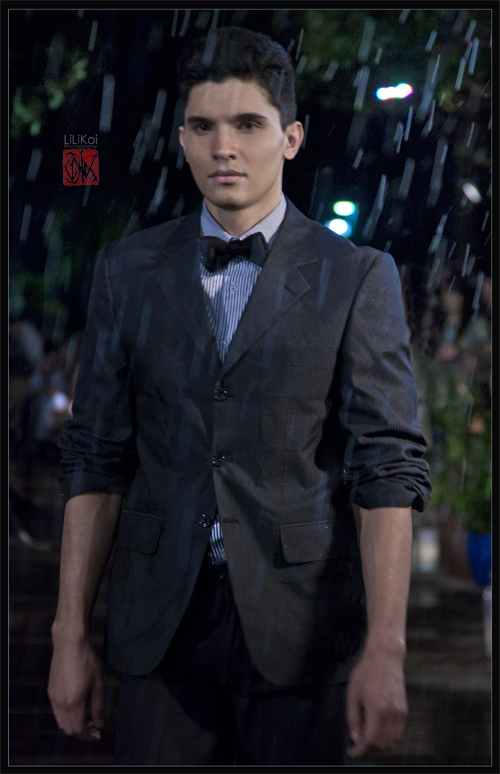 My photos came from Andi Gaspar and Tracy Chan.